This is wonderful and how nice to hear about a 12 year old actually writing a note. You have every reason to be proud of him. Have a fabulous weekend my friend. AW! how wonderful for him to have this chance. As for the note, it seems to have gone out of fashion more the shame, good for him, I suspect they will be over the moon to have something like this. He deserves a big hug. How exciting that he got to go to camp! I bet he had the time of his life! 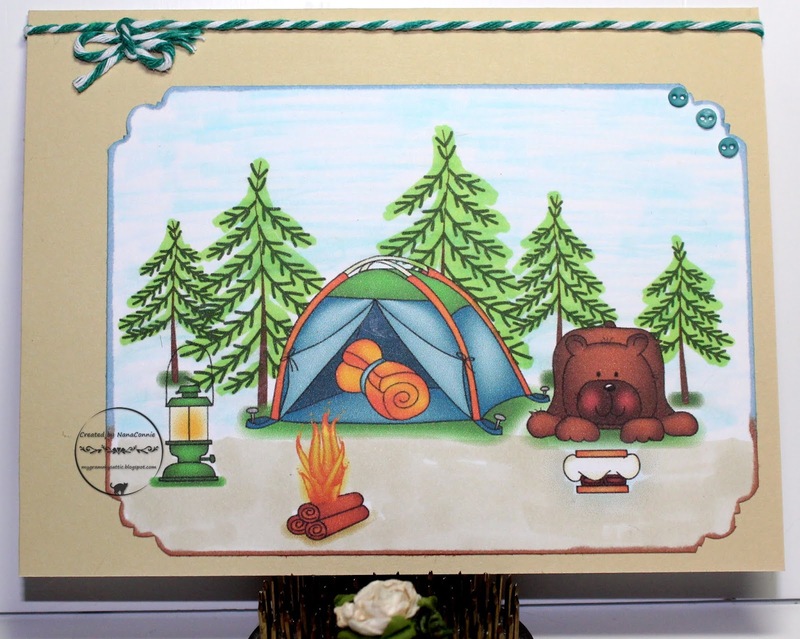 Your camping scene card is adorable and I am sure the Sorority Sisters will love it!! My son and his wife just found out that their youngest (4)(and my youngest granddaughter) has Type 1 too. Sad. It's a life changing experience for them. They were actually telling me about camps like this for the future for little Emily! I'm sure he loved every minute of it and was so well cared for. I know he loved the card and that's the sweetest to send a thank you to the sorority! Perfect! How cool is your story, and even more awesome that he wanted/asked for a card to send to say Thanks! Your card is wonderful and perfectly fits the bill!!! We camped so much as kids- family was way too large for hotel rooms...but we mostly loved every minute of it! This is a lovely scene. Thank you for joining in the Crafty Cardmakers challenge. Wonderful card. Thank you so much for sharing with us at Lemon Shortbread Challenge Blog. I hope you can join us again soon. What a wonderful experience for your grandson. I'm sure his sponsors will love the written thank you and the darling card you created for him to send it in. Thanks for sharing at Addicted to CAS.